Why Do Text-Heavy Games Make Reading So Painful? In today's short-but-sweet installment of Read Up on Kotaku, commenter RevRain wonders why developers spend days filling their games with tomes of ancient lore without putting nearly as much effort into delivering a pleasant reading experience. 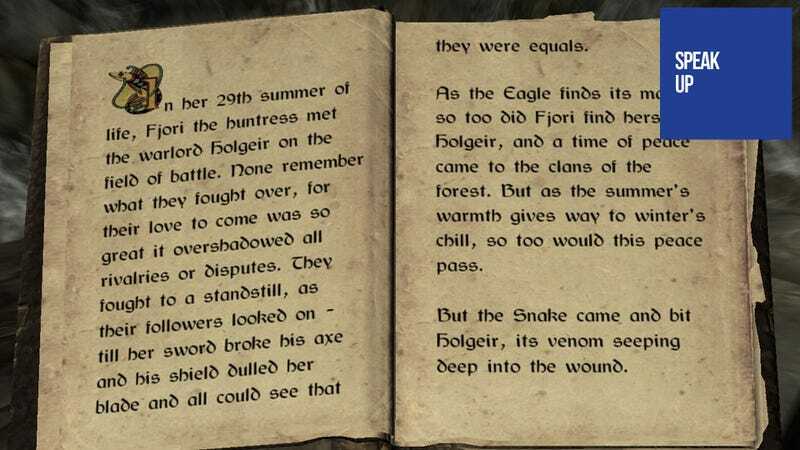 A lot of games require you to read lots of text be it in a form of a mystic tome of ancient lore, or an e-journal of the victim of thrilling crime… Yet why are so many games unfriendly to the reading experience itself? I mean such tiny letters in a black/white/gold contrast or whatever. I'm usually sitting 3-4 meters afar from the screen so the text is readable but not comfortable. That's why I usually skip reading parts in games.